Even when you're meant to be toasting marshmallows over a camp fire! 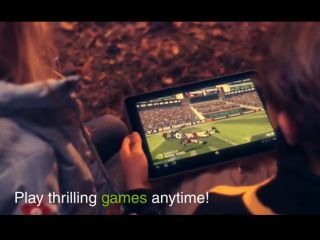 The Acer Iconia Tab A200 has emerged in an advert that is so cheesy it has to be for real. "In truth a family is what you make it," it begins, setting the bar for ridiculous parallels between healthy human relationships and owning an Acer tablet. It doesn't give masses away on the spec-front, but the A200 is definitely an Android tablet – we think Honeycomb (Android 3.x), which makes sense given that Ice Cream Sandwich would probably be aimed at a less family-esque audience. The advert explains that you can "play thrilling games anytime!" and "get deep into amazing ebooks", before going on to exalt the sharing abilities of Acer clear.fi and the slate's front-facing "webcam". No clues as to Acer Iconia Tab A200 UK release date, but the snowfall at the end of the advert is a hefty hint indicating that it's going to be pretty soon. There's no way of knowing whether the Iconia A200 is rocking a newly minted Tegra 3 quad-core processor, but we suspect not if Acer's hoping to get this puppy out in time for Christmas. If all this has reminded you that family is "made strong not by number of heads counted at the dinner table, but by the rituals your family members, created by the memories you share, by the commitment of time, caring and love you show to one another," then the Acer Iconia Tab A200 could be the tablet for you.